One of those few things that I never grow tired of doing during summer is to be in Bucas Grande group, this secluded place is like home to me. The peaceful environment with its natural attractions has captured my heart and nagged me to savor its beauty even just once in a year. 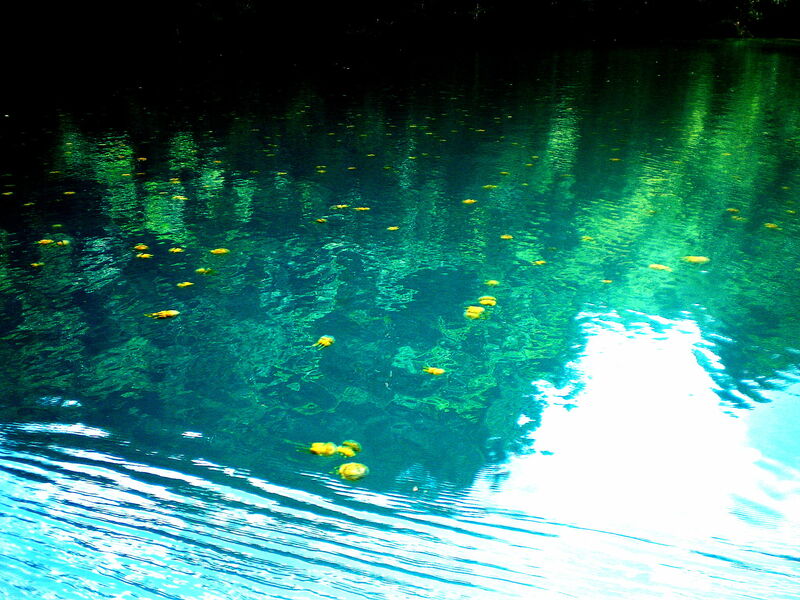 A couple of weeks ago, I went to my paradise unexpectedly, it was unplanned although I knew I must go. So I seized the opportunity when my trip up north was postponed due to unfavorable weather. The adage was true that while the city is in typhoon, it doesn’t mean that in the distant islands it’s pouring rain, the sun was perfectly shining like summer! My sister dropped everything back home when I invited her, although at short notice she simply gave in to my whim. Leaving Butuan almost 2pm, we arrived almost 4pm in Bad-as junction and was grateful that van for Port Hayanggabon was stationed leaving any minute. The afternoon sun gives a warm glow as we drove along the coastal towns of Placer, Bacuag, Gigaquit and Claver. We arrived at the port almost sundown, our boat waiting. Rushing to buy for needs, we left almost getting dark. The stars started to appear in the skies and some fireflies welcomed as we cruised for our night’s lodge. The boatman with trained eyes managed our boat single handedly until we reached at Tiktikan Lake almost 7pm. Somehow I still have gotten energy to climb up to the reception area even in dark with only a small torch to illumine our way. Just as it is, everything so natural and unspoiled. There’s no electricity, but they got used to it already, the small kerosene lamp served as our light. The cicadas singing in the darkness, cutting the stillness of the night. We woke up the following morning watching the placid lake before us and the sunrise breaking behind the limestone cliffs. We rushed to the information center for a courtesy hi with DH, somehow I’m grateful with all the necessary arrangements he made for my trip, even how short the notice was. 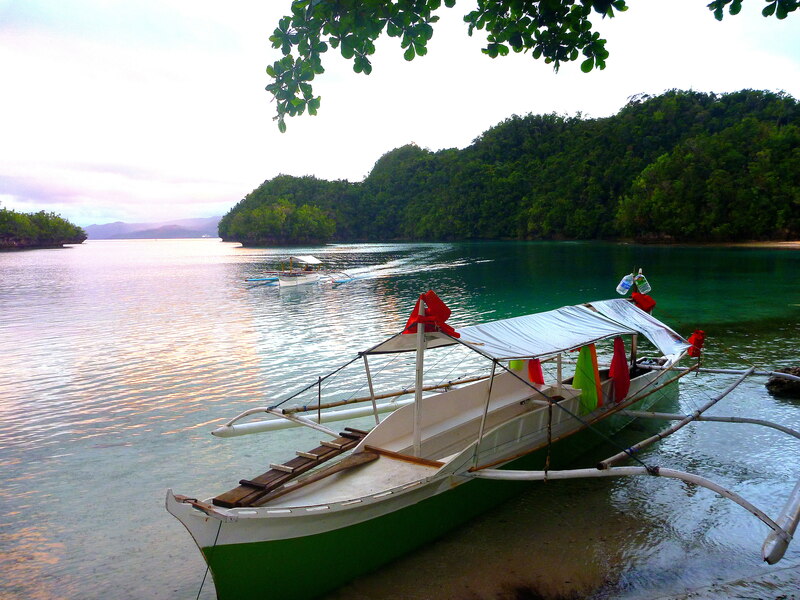 So we started early taking advantage of the low tide, I wanted to revisit the hidden charms of my paradise. I always feel that familiar rush of blood flow when entering the cove, so mysterious it felt like I’m transported into another world. 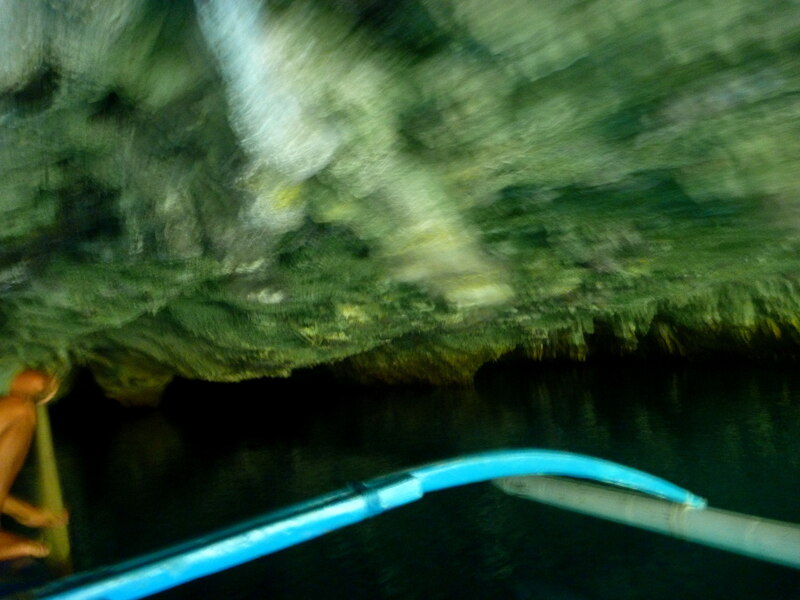 We went around and got first into Hagukan Cave, swam inside, stayed for awhile and mingle with other guests. 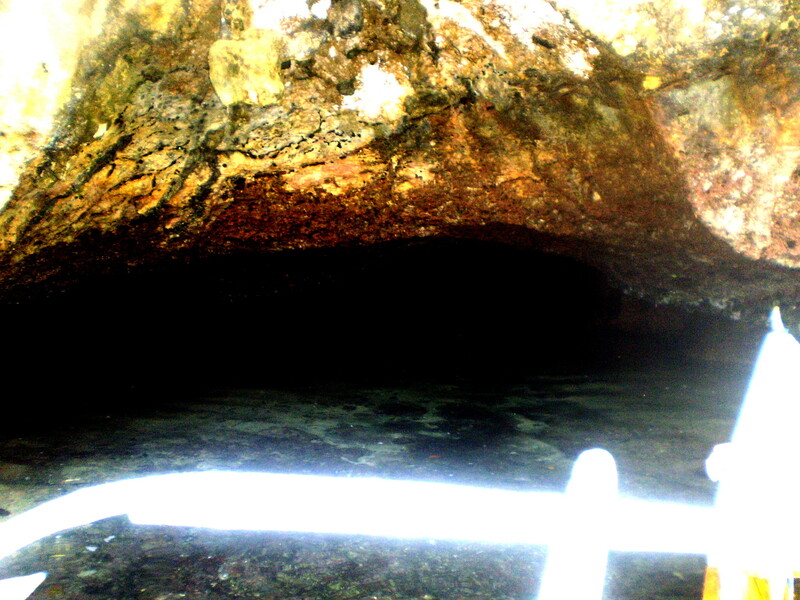 We then proceed to the challenging Magkakaub Cave, walk inside, view the formations and the fruit bats up, then went rock climbing for the exit. Well, we got at the ramp ready for the plunge but alas I still have to gather much courage for the jump 😛 It’s my fourth time and yet my spirit needed some urging. It felt so free having the big leap, the big splash and the water rush felt so good! 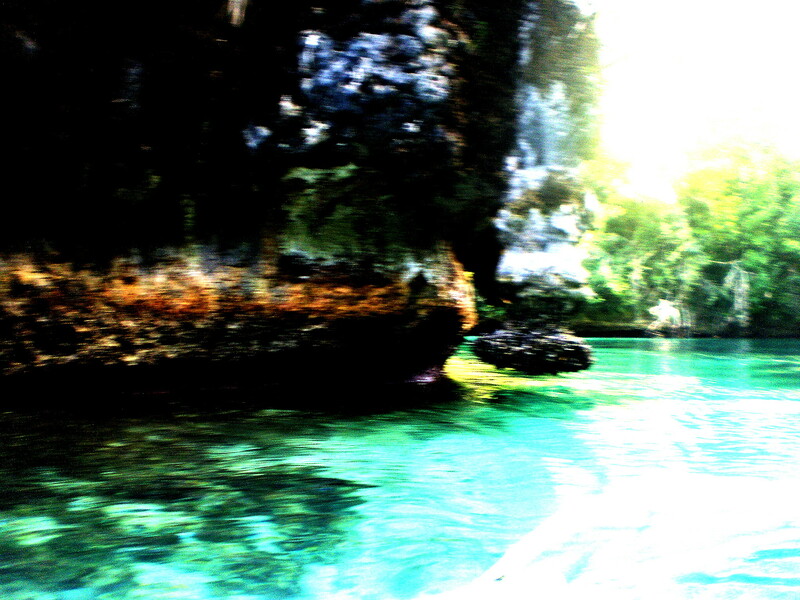 🙂 Navigating around the cove watching limestone cliffs covered with greens, clear waters and blue skies is like paradise to me. My most favorite spot here is the Jellyfish Lagoon (Tojoman Lake), I was ecstatic when DH told me it’s peak season of the jellies! When we entered the lagoon, all others were coming out so it was comforting it won’t be too crowded. And there I watched in awe, of my brown friends starting to float up in view. I swam around getting up close with them. My sister can’t believe it’s stingless. All of them in varied sizes, pulsating like talking to me, and swimming right there all around me. I stayed in the waters long to my heart’s content, swimming with my jelly friends. I still have wanted to linger more but my companions seemed tired already, so I finally went up the boat feeling sorry I have to leave. After our late lunch and brief rest back at Tiktikan Lake, we cruised to La Fortuna to explore another inland lake there and hoping to get some fresh buko. We walked on a trail to the lake and have some swim there. 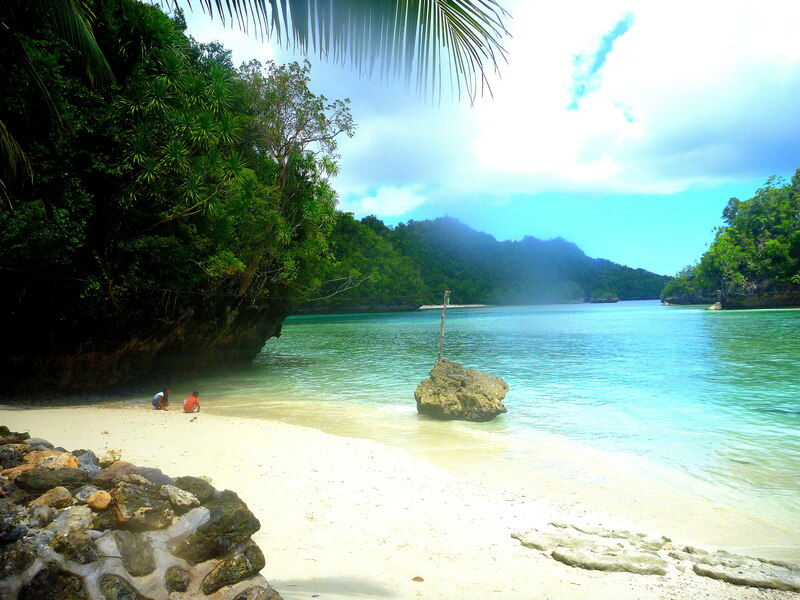 When we got back, we swam on the white beach while waiting for our boat. I missed Spirit, it should have been fun playing with him in the waters. We cruised to another spot to buy some buko, it was a white beach too and while waiting I swam again with the waves pushing me ashore. 😛 We got back to the info center, catching up DH with some visitors. We savor the fresh buko lamaw while discussing latest updates in the park and the PO. We hastily finished up to see the spot where the new cottage owned by SAVE Sohoton was built. Actually, it’s a good improvement – a new economic activity of the PO. It sat in a cove with turquoise waters and white sands, a simple cottage of indigenous materials still with works on-going. It promises a wonderful spot for swimming, snorkeling or just lounging on the small patch of white beach. We rushed back at the info center and finally sailed to the guest house for night’s refuge, when it began to get dark. The next morning, we woke up watching the placid waters from our window. How serene and beautiful, so peaceful and divine. I knew I never grow tired of coming to this place. 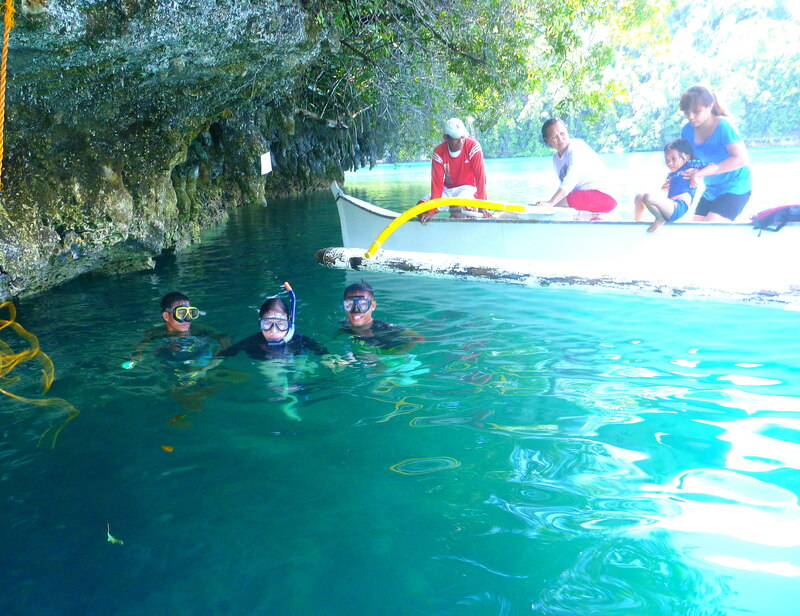 I was too glad that it has maintained its unspoiled beauty, its people have well-preserved its environment. I was glad I didn’t see any litters, except few when we got to the lake which our guide defended coming from open waters brought by the tide. 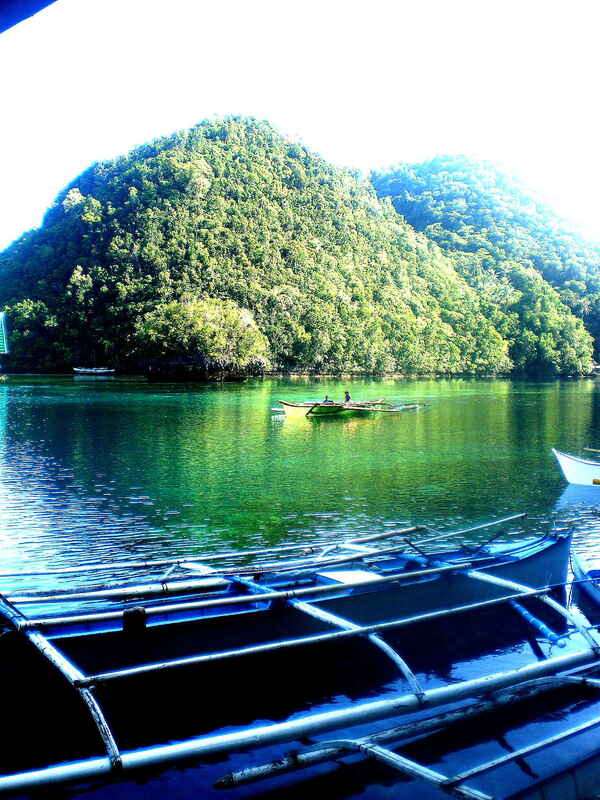 Sohoton folks have done great job in preserving this paradise.